How global and local organizations can work together as true partners to co-create effective, responsive interventions. Civil society organizations (CSOs) play a vital role in social justice and human development. Yet their ability to fulfill their missions is often constrained by their capacity, funding, and operating environments. Additionally, threats to civil society globally have increased in recent years, as the rights to meet, organize, publish, and drive change through civic action have increasingly been curtailed. USAID and Sida, along with a growing alliance of partners, sought to support civil society across their work and combat growing repression by developing a global network of civil society innovation “hubs,” each tailored to support local needs and goals. 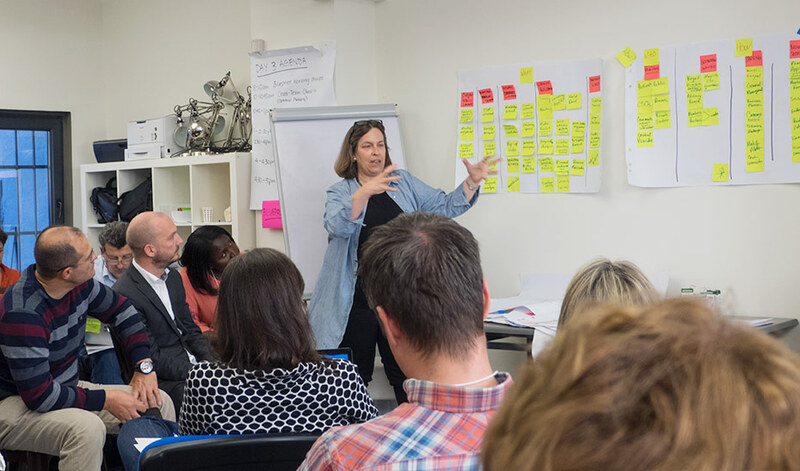 Seeking to work with civil society as partners, rather than directing design as the key funders, USAID and Sida engaged hundreds of CSOs in a co-creation process to collaboratively define key features and parameters of the hubs. Reboot was asked to develop and co-facilitate the hubs’ design process, starting with the inaugural convening and continuing through 1.5 years of co-creation, in partnership with CIVICUS and Counterpart International. The first global convening gathered more than 60 representatives from 45 organizations. We started by building a community of collaborators and then guided that community through a series of dynamic exercises to draw out participants’ perspectives and individual areas of expertise. Our workshop design and facilitation navigated the natural power imbalances within the group to create the space for all voices to participate authentically. Together, we developed a blueprint for an innovative global initiative that was then built out over a year-long process of regional and global workshops. The success of our approach was reflected in participants’ ownership over and commitment to the initiative, and in the funders’ decision to document and widely disseminate the process we had helped pioneer. Today, there are six regional hubs—across Africa, Central Asia, East Asia, Latin America and the Caribbean, the Middle East and North Africa, and South Asia—developing new partnerships and innovations to defend and strengthen civic space, and overcome restrictions to citizens’ basic freedoms of assembly, association, and speech. Civil society organizations are critical to the strength of the social contract, serving as service providers for vulnerable populations, organizing citizen interests, and holding the powerful accountable. Recently, world leaders and development practitioners have watched increasing threats to civil society around the world with growing alarm; in 2013, US President Barack Obama announced his “Stand with Civil Society” initiative, calling for the international community to combat such repression through innovative responses. In line with the president’s initiative, USAID and Sida set out to expand civic space and support the work of civil society in general through the development of a global network of innovation “hubs,” each tailored to support the goals and needs of civil society communities in a specific region. Rather than determining the design and driving the creation of the hubs, the donors sought to work with civil society as full partners in the initiative. After soliciting and receiving ideas from around the world, they organized a series of global and regional co-creation workshops, with the goal of collaboratively setting the foundation and building the ethos of the new initiative. By inviting civil society organizations to participate in the creation of the hubs, USAID and Sida were demonstrating a commitment to incorporating the key constituents of the hubs throughout the process. They were also taking on a difficult challenge: Done well, co-creation is time consuming and complex. The beginning of the process requires more effort to break down traditional power boundaries and invite multiple voices together in a shared process. But when the groundwork is thoughtfully laid, a participatory process yields results that are much richer and more appropriate and sustainable, and that have greater ownership from users and stakeholders. To ensure that the civil society hubs benefited from the full participation of civil society, USAID and Sida invited Reboot to design the model for the co-creation workshops, and to co-facilitate them with CIVICUS, a global consortium of civil society organizations. Over the course of eight workshops, we developed the design for each of the hubs and identified local organizations that could own their development and management. From there, Reboot served as an advisor to support the hubs’ ongoing strategy, design, and innovation efforts through their incubation period. We sought to first build an invested community of collaborators, and to overcome people’s natural biases when designing new initiatives. Co-creation and similar concepts of participatory development are not new, but they are underutilized and often poorly executed in the development sector; the decision to take a co-creation approach was an experiment for USAID and Sida. It was novel for many of the participants as well, including some who brought a dose of skepticism to the workshop (based on negative past experiences of rapid, shallow consultations (”as insultations,” noted some) they had participated in with other international organizations. Creating the right balance of flexibility and structure enables participants to develop ideas that are both innovative and practical. Our approach empowered participants to experiment, ideate, and iterate, constructively channeling their creativity within a thoughtful structure. Co-creation convenes diverse stakeholders and asks them to collaborate in unfamiliar ways. These stakeholders often bring individual perspectives, interests, and expectations that may not align within a shared vision. Ensuring co-creation respects and draws on individual expertise, and leverages it in service of collective goals (not individual interests), can be difficult. Our design of the co-creation process was, in fact, the design of a community-building exercise that helped participants identify with and support the broader goal, and subsume personal and organizational interests. To do this, we conducted user research with all participants, surfacing individual needs and motivations that the process needed to address. This allowed us to design a co-creation experience—which included eight workshops in seven countries—that respected discrete voices and inputs, but which also directed group decision-making toward collective progress. The co-creation exercise itself followed an adaptive, collaboratively defined process: some workstreams and activities were pre-designed, while others shifted in response to the evolving dialogue and participant suggestions along the way. We framed conversations to draw on the experiences of less-privileged voices, and asked the more-powerful actors to be transparent around their interests and resources. At each gathering, high-energy prototyping exercises built comfort, while “open spaces” break-out sessions created diverse and self-driven opportunities to discuss tangential topics and empower less-vocal participants. Over time, participants took on increased leadership over the process and self-organized into working groups—even volunteering extra time in their enthusiasm for the initiative and the process—which was ultimately critical to the initiative’s success. 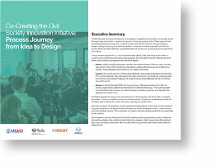 Throughout the co-creation process, we helped synthesized key conversations, distill emerging design parameters and constraints, and proposed concepts for design and implementation. We did this both through dynamic synthesis exercises, visual facilitation techniques, and visual communications, to ensure all stakeholders (donors, CSOs, and other stakeholders) in this complex process understood what was happening, when, why, where, and how. Our materials became the blueprints for the initiatives, and our process toolkits became critical guides for CSOs in the design of individual hubs. Thanks to the the enthusiastic efforts of all collaborators, the co-creation process achieved its goal: to launch a successful network of six civil society innovation hubs that defend and strengthen civil space around the world. In building community around and trust in co-creation, our process laid a strong foundation for the initiative. 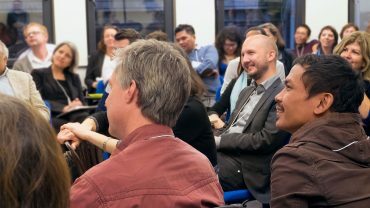 From the first convening—where a participant noted, “we surfaced really interesting ideas in the design process, which put into currency the use of new language, concepts, and thinking around civil society programming”—through to the launch of the hubs, co-creators left each gathering with perceptible buzzes that are rare for global workshops. This kind of energy and momentum was harnessed to creating the pioneering initiative in operation today. More broadly, the experience showed that co-creation, when approached thoughtfully, can succeed. Instead of seeking to support civil society as passive “beneficiaries,” the initiative created a precedent for future participatory design exercises. USAID and Sida were so enthusiastic about the co-creation process Reboot defined and helped implement that they engaged a process historian to document the process (and “capture its magic”) to share with other donor initiatives that seek to work in a bottom-up, collaborative manner. The process has since been used in strategic planning and design initiatives with other partners, including UNDP, the MacArthur Foundation, and the global open knowledge and open contracting movements.